Drawing in a straight line is not a problem with my trusty metal ruler, it's the going round corners that is! But there are quite a lot of general items around the house that are there to help you. For instance drawing around an empty box to get the square or oblong you want is useful just make sure that the box is sturdy enough as you draw. 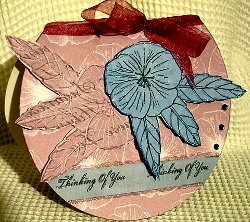 This little card was easily achieved by using a side plate. Place it partly off the card at the spine end and just draw around it. Then with my craft knife I simply followed the line and cut it out. Where the plate was over hanging the spine will give you the hinge part to the card and allow it to stand. Egg cups, tea cups, CD's all give you the same result, and some pastry cutters are already in a shape and just need to be traced round. Use a pencil and draw lightly, this will leave you room for any mistakes you make and can be easily rubbed out after. So don't forget a good eraser too. 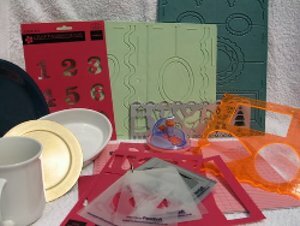 There are lots of tools that you can buy as well that will help you with this process Try using stencils or templates. They come in all shapes and sizes. The alphabet will help you produce the name of the recipient that you may want to add to your projects, and numbers will do the same. There are many magazines that give away templates in their publications and if you don't want to spoil the template pages in them then use tracing paper. Draw over the shape you want to copy and then on the reverse of the tracing paper go over the lines again. Now when you place your tracing paper down on the card and go over the lines again, the image is transfered across. And if you do this on spare piece of card and keep it safe you will always have your own template to use again. Or you can simply photocopy them. All these things will help you when it comes to drawing shapes and I am sure that you will gather more ideas as you go along.